Despite of strong electronic connotations this EP is not related to Modern Love, a visionary techno imprint from Manchester. 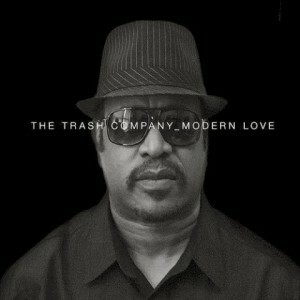 Because Max E. Monroe, the artist behind The Trash Company, composed the tracks about 20 years ago and these were initially rejected by Capitol Records. Until recently Monroe from Richmond, Virginia was among the unknowns of the music world, before his talent (or potential) was discovered by People’s Potential Unlimited (PPU). After the LP “Earle Hotel Tapes 1979 – 1993” and a single on PPU, The Trash Company now bravely blends different genres in “Modern Love”. The heaviest punch comes for the start when Monroe performs blues over scarred electronics in “Tired Of Drinking Whiskey”, a track dripping of virility and hard whisky nights. Then the macho side is abandoned with Rama’s entry in “Mind Games”, when she drops nonchalant vocals on wavy electro like a predecessor of Kim Karli and Rudolf Klorzeiger. “Manchester Stomp” sees bass topped with clear-sky pads while arousing electro hop joint “Hot Stripper” gets a Parental Advisory warning. Monroe’s harsh voice reappears in downtempo title track, feeling melancholic in a jazz bar of broken hearts and hints of exotica set the tone in moody “Mellow Yellow Sunday”. Provocative and passionate release from the archives, released by Thug Records from Narrabeen, a suburb north of Sydney.